Baby Beluga by Raffi is an old favorite of mine. When Auntie K was little she had the tape (yep, tape) and we listened to it...A LOT. My mom wanted Sweet P to experience Raffi and Baby Beluga and bought her the Baby Beluga CD a few months ago. 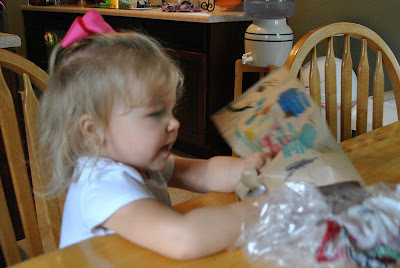 Then, for her birthday she got a stuffed blue whale and a book with the Baby Beluga lyrics from my grandpa (Paw-Paw). Needless to say as soon as we finished this project, she picked up the whale and exclaimed, "BABY BELUGA!" Love that kid. markers, Do a Dot markers, paint, etc. 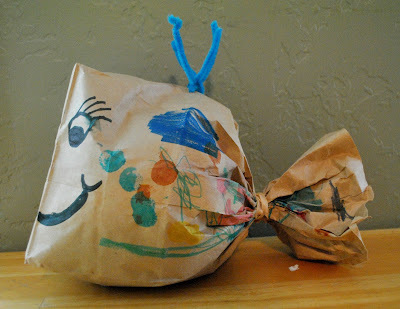 Have your kiddos color the sides of the bag. If they are old enough to draw eyes and a smile have them do that, too (I had to help Sweet P with that). Fill the bottom half of the bag with plastic bags or newspaper. Cut the blue pipe cleaner in half and bend both pieces. Poke the ends of the pieces in the top of the bag to create a spout. Tie off the bag with a rubber band. Remember to leave room to create a tail. You're done! There's your whale! Baby Beluga eats dinner with us and swims around the living room. Here's the rest of our W week.